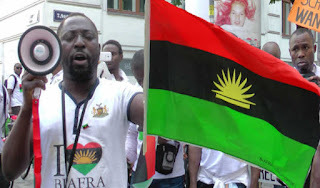 The planned sit-at-home protests organised by the Indigenous People of Biafra (IPOB) and Movement for the Actualization of the Sovereign State of Biafra (MASSOB) is generating tension in Southeast states of the country. The groups have ordered the closure of markets, and restriction of movement, to celebrate the birth of Biafra and honour war heroes and slain activists. The late Chukwuemeka Ojukwu declared the independence of the Republic of Biafra on May 30, 1967. The civil war started on July 6, 1967 when the then Head of State General Yakubu Gowon declared war to end the secession. The 30-month-old civil war ended on January 15, 1970. But the Nigeria Police had deployed its officers and equipment in the Southeast vowing to decisively deal with the pro-Biafra protesters. There was deployment of anti-riot policemen at strategic locations in Enugu yesterday evening at strategic locations such as major markets and the federal and state civil service secretariats. The Enugu State Police Command yesterday said it would deal decisively with agitators that attempt to stop people from going about their normal activities. The Enugu state police spokesperson, Ebere Amaraizu, in a statement, said the police is working with other security agencies to forestall the breakdown of law and order. “Ahead of the planned sit-at-home order being circulated by IPOB, MASSOB, amongst others, the Enugu State Command of the Nigeria Police Force has advised members of the public to disregard such order and go about their normal lawful business. “The Command is also advising law-abiding members of the public to watch out for any person or group of persons under any guise who will come to intimidate, threaten or force them to shut down their offices or shops and report such threat to any nearby police station. “The Command in partnership with other sister security agencies and relevant bodies have put in place adequate machinery as security apparatus have been mobilized to fish out those in this habit and bring them to book. “The Command has advised those intending to carry out this unpatriotic and unlawful act to change from this, as the Command working in partnership with other sister agencies in the state, will not sit and fold its arms and see innocent and law-abiding citizens of the state being molested or threatened by any person or group of persons,” Amaraizu said. Also, the police spokesperson released phone numbers, and social media platforms, urging members to report any breach of law and order today. But the sit-at-home order by IPOB and MASSOB to mark the Biafra Day celebration seemed to have suffered setback yesterday when senior clerics in the Southeast distanced themselves from the move. The Archbishop of the Enugu Province, Anglican Communion, Most Reverend Emmanuel Chukwuma, said the clergy was not in support of the order. He made this position known yesterday in Enugu, during the Democracy Day celebration and second year anniversary of Governor Ifeanyi Ugwuanyi. “Before I offer the opening prayer, let me first of all state the position of the clergy on the sit-at- home declaration by IPOB and MASSOB. “We are not in support of the call. We advise all to ignore it and go about their legitimate businesses,” he said. Also speaking on the increased agitation by the Southeast, a former Military Administrator of Kaduna State, Brigadier-General Jafaru Isa, said in a recent interview with the Daily Trust that Biafran agitators should rather support President Buhari because no past government in Nigeria reached out to that part of the country like him. General Isa said many road projects are ongoing in the South East, in addition to several key appointments for people from that zone. “This difference will impact positively on the lives of the people in that region and I think the government should be happy and proud that it is doing something. “But, if people are still looking for more, it is normal, nothing is wrong with that. But again, if you ask for more you should also have the capacity to be able to know what it is that could be possible to be done under the circumstances.